industry leading SSD performance and capacity. reliability and long lasting life needed by the most demanding users. A key technology of the OCZ Vertex 2 is the Sandforce 1200 Controller. to fit every budget and performance level. upgradeable and customizable machines with long term stability. Upgradeable Intel i7, i7 Extreme and Xeon series processors. Support with up to 24GB of memory. need access to powerful computing. 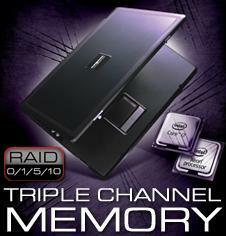 cache and support for up to 24GB of DDR3-1600 memory.